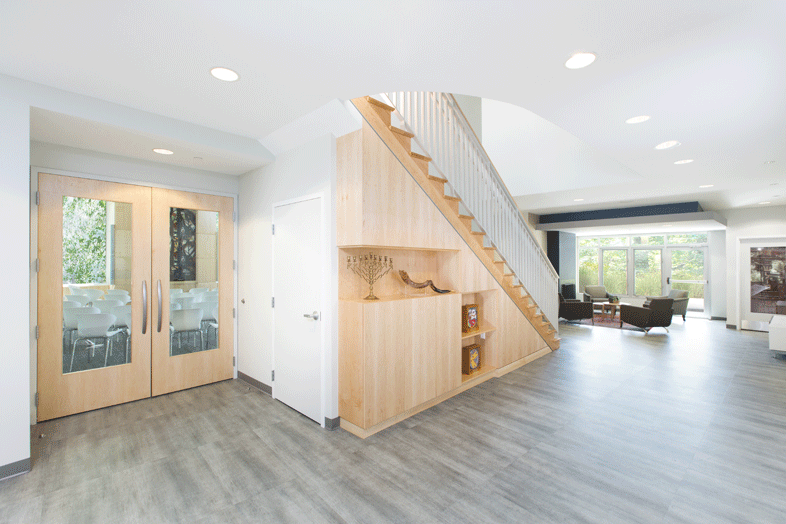 In 2015, Kaplan Construction was commissioned to build a new 8,500 SF, two-story building for Congregation Beth Shalom of the Blue Hills in Milton, Mass. Following a long and unsuccessful search for a suitable site to house Milton’s only Jewish congregation, town resident and temple members Marvin A. and Andrea Gordon donated a 1.9-acre site that was once part of a 10-acre kosher dairy farm run by Marvin’s grandfather. 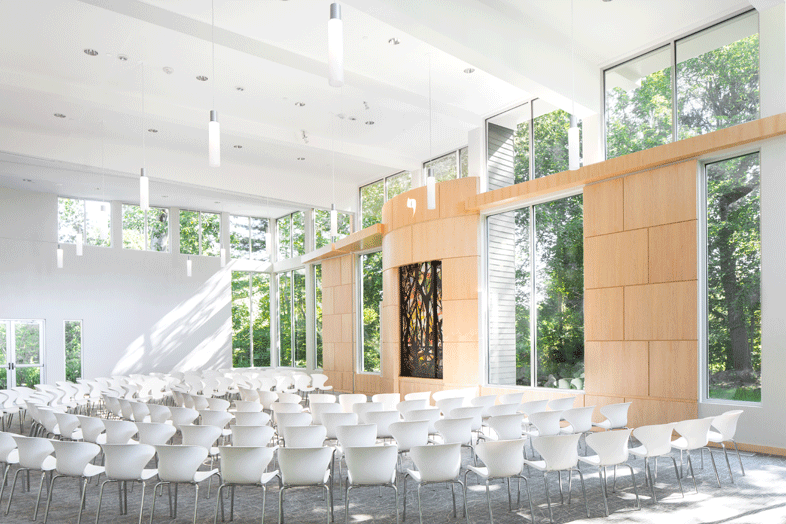 Simplicity and flexibility stand out in the synagogue’s light-filled design that reflects the beauty of the wooded surroundings through the predominantly glass facade. The focal point of the synagogue is the Ark with its finely crafted doors. Custom-built by Toronto artist Temma Gentles, the symbolic steel and fabric parochet was designed to complement the outdoor scenery on view through the windows of the sanctuary. Kaplan provided design guidance and cost analyses, and set milestone dates so that the construction of this significant feature could work seamlessly into the overall project schedule. The building also features new classrooms, offices, a library, kitchen and areas for socializing. The sanctuary seats 160 people for the High Holidays. “Our sanctuary is the heart of our synagogue. 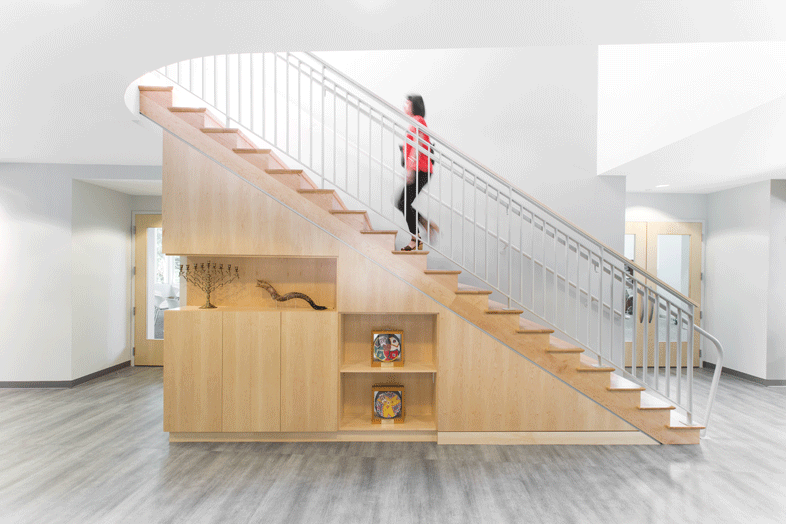 We wanted to revitalize our physical and spiritual space to reflect our identity and ambitions, and selecting Kaplan Construction was a monumental decision in making our vision become reality. Kaplan Construction was able to address our concerns and thoroughly explain various project delivery methods, patiently helping us strategize on procurement methods and work together to develop a scope that fit our budget. Kaplan has quickly become a trusted partner and resource.